The John Hopkins Nursing Evidence Based Practice Model includes five steps in its searching for evidence phase. They are listed below. ​​Identify your topic – use your PICO. Identify the resources to search. Assemble and sort your search terms. Run and refine your search. Record and evaluate your findings. To begin constructing your search strategy to find the evidence, you must first identify your the key terms related to your topic. The best way to accomplish this is by examining the PICO question you developed during the practice question phase. ​**A note: The librarian does not recommend using Google as a starting place for your literature searches. The huge amount of unrelated and low-quality results can be overwhelming for a novice searcher. If using the below databases does not produce adequate results, please contact the librarian at harte@ellismedicine.org or 518.243.4381 for assistance. CINAHL is our most frequently used nursing database. It contains citations for articles from over 3,115 nursing journals. Some of them are available with full-text access. **You can download these instructions as a PDF by clicking the arrow in the upper right corner. but the full-text is not available? See the below instructions for using the TDNet Search Box on the ellismedlibrary.org homepage! You can also email your request to harte@ellismedicine.org. ***To reach the TDNet portal from home, you will need to create a login from an Ellis computer first, or login via Citrix. For help, please contact the librarian at harte@ellismedicine.org . ​The Ovid Nursing Database contains over 400 indexed nursing journals and periodicals, with about 100 of these available in full-text. PubMed offers a number of advanced services that can make searching for the answer to your clinical question easier. ​PubMed has a built in clinical query search that allows you to search for articles based on the type of clinical question you are asking, such as therapy, prognosis, etc. Watch the above video from the Health Sciences and Human Service Library at the University of Maryland to learn how PubMed Clinical Queries work. ​This tutorial was created by the National Libraries of Medicine to help guide nurses through the PubMed search process. Click the image above to access the web tutorial. ​MeSH (Medical Subject Headings) is the National Library of Medicine's controlled vocabulary thesaurus, used for indexing articles for the MEDLINE®/PubMED® database. Each article citation is associated with a set of MeSH terms that describe the content of the citation. If you can search using MeSH entry terms instead of keyword searching you can focus your search and find more relevant citations. Booleans are operators (like + and – in math) that were created specially for searching. Let's say you wanted to conduct a search for articles about nurse-to-nurse shift reports and how they relate to patient safety. And let's say you know shift reports are also called hand offs. We used OR because we want to return results with either shift report or hand off because those terms mean the same thing, and authors may have used one of these terms or the other, but probably not both. We used parentheses ( ) to separate the OR statement from the rest of the Boolean phrase, otherwise we’d be searching for the term shift report by itself– or hand off + nurse + patient safety. ​Information on the course of a disease or condition over time, expected complications. To reduce the chance of disease by identifying the risk factors and modifying them. For more in depth information on the levels of evidence, please visit the Oxford Center for Evidence-Based Medicine website. 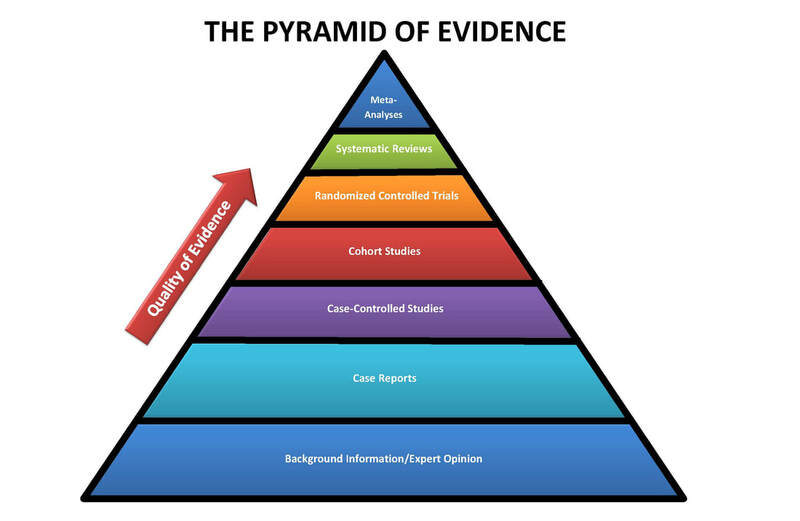 Background knowledge and expert opinions represent the lowest level of evidence for informing evidence-based practice. This type of evidence may take the form of a book chapter, an editorial in a journal, or an entry in an expert-based resource like Up-To-Date. Because these resources are not the result of high-quality research, they are useful for learning more about a topic but not for applying to your practice as the evidence base. ​Case studies and case reports represent one of lower levels of evidence in the medical literature. These are typically detailed descriptions of an unusual manifestation of an illness or condition in a particular patient, including the symptoms, diagnosis and treatment. Case-control studies are a higher level of evidence than both case reports and expert opinions. They compare patients that have a disease or outcome to patients that do not have a disease or outcome by looking back through these patients histories to compare how frequently exposure to a risk factor of interest occurred in each group. Cohort studies are often the highest level of evidence that can be found for both etiology and prognosis questions. In cohort studies, a large group of subjects without a disease are defined by a variable (like birth year, etc.). At set periods of time in the future, they are studied to see if they have developed a disease or condition of interest, and this helps to define a causal link between a risk factor and a disease. Unlike case-control studies which look backward in time after someone already has a disease, cohort studies follow a group of people forward in time to see if the disease develops. Randomized controlled trials (RCTs) are one of the highest levels of evidence because they can statistically prove that an intervention has an effect on an outcome. RCTs are studies that involve the random allocation of participants to two groups: one group that receives an intervention or treatment, and one group that receives standard care or a placebo. The clinician conducting the study is blinded to which participants will be assigned throughout the trial, so results are unbiased. Forming the second highest level of evidence, systematic reviews are a comprehensive review of the existing medical literature meeting a set of eligibility criteria as it pertains to a pre-defined research question. What this means is that researchers create a systematic, reproducible search strategy to uncover all related articles. They then analyze all of the articles (usually randomized controlled studies) related to a clinical question and that meet the criteria for inclusion, and summarize the findings. The researchers then make recommendations for clinical practice based on the strength of the evidence they find. The Effectiveness of Cooling Packaging Care in Relieving Chemotherapy-Induced Skin Toxicity Reactions in Cancer Patients Receiving Chemotherapy: A Systematic Review. A meta-analysis is a type of systematic review that combines through statistical analysis the data from multiple studies, and identifies a common treatment effect. This is considered the highest level of medical evidence, and is thus placed at the top of the pyramid. A Systematic Review and Meta-Analysis of the Pros and Cons of Consuming Liquids Preoperatively. The John Hopkins Nursing Evidence-Based Practice Model has a guide which covers the different levels of evidence and quality of studies. It can be downloaded here. ​After scouring the databases for studies that represent the highest level of evidence for your clinical question, it is time to evaluate the articles you have found. It is not enough to just read the articles on your given topic. You need to understand the strengths and weaknesses of each study before deciding whether to apply its recommendations to your clinical practice. ​Adapted from Melnyk, B. M., & Fineout-Overholt, E. (2005). Evidence-based practice in nursing & healthcare: A guide to best practice. Philadelphia, PA: Lippincott Williams & Wilkins. Reading a research paper requires a different skill set than reading a novel or a newspaper article. Research papers are organized into distinct sections, and knowing which sections will provide you with the information you need to determine the results, relevancy, and validity will save you time and energy. Below are some short, simple videos that explain the how to efficiently read scientific articles. ​The library has access to several eBooks on evidence-based practice that have chapters on appraisal. To access these titles off-campus, please contact the librarian for login credentials. The John Hopkins Nursing Evidence-Based Practice Model provides two tools to assist in the appraisal of individual studies, one for research studies and one for non-research studies. You can download both of these tools here. ​​Validity is a measure of how sound a research study is. Does the study do what the researchers claim it does? There are two types of validity that you should look at when appraising the validity of a study- internal and external. Internal validity is how well the design and methodology of the study prevented any other factors from influencing the results besides the intervention under study. In order for the results of a study to become the basis for evidence-based practice, it must have both internal and external validity. Here are some articles that can further explain how to assess the internal and external validity of a research article. ​Heale, R., Twycross, A. (2015). Validity and reliability in quantitative studies. ​Below are a number of videos that explain internal and external validity that may help with your understanding of these concepts. 1. ​ What are the overall results? 2. How precise are the results? When trying to determine the overall results, you should be ​looking for the "Results" or "Findings" section of the article. The results may be presented in numerical format. When looking at this section, try to determine if the results are clear to you. Did the authors find a difference between the control group and the experimental group? And if the authors did find a difference, how large was the confidence interval? A smaller confidence interval indicates a more precise result. ​Below are a number of resources that can help you understand the statistical terminology you will encounter while reading research papers. Here are several textbooks you can refer to if you'd like more in-depth information on statistics in research. ARE THE RESULTS RELEVANT TO MY CLINICAL QUESTION? After you understand the results of the study, and have determined that the study is valid, you must then determine whether the results are relevant to your clinical question and your local population. ​​Are patients in this study similar enough to the population you are hoping to apply this to? Have all the important clinical outcomes been considered in this study? Do the benefits found in this study outweigh the risks to patients? The Critical Appraisal Skills Programme out of Oxford, UK has developed a number of easy-to-use checklists to promote the practice of evidence-based medicine by helping health care staff make sense of scientific literature. These are free to download and use under the Creative Commons License. In 2010, the American Journal of Nursing published a series of articles on EBP. Three of these articles focused on the critical appraisal of nursing literature. Below are full-text links for this series. John Hopkins provides a tool to help you summarize the evidence from the articles you've collected, called the Individual Evidence Summary Tool. You can download it here. John Hopkins provides an Evidence Synthesis and Recommendations Tool, which you can download here. This tool guides you through the process of making evidence-based recommendation from your findings in the literature.